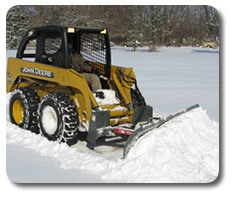 Front loader snow blades and skid steer snow blades from SitePro® are ideal for residential or commercial snow removal. Use these snow blade attachments on driveways, parking lots or other large areas. Blade floats to clean uneven surfaces and locks for grading loose dirt or gravel. Two trip springs for controlled break over in snow. 7.5- and 9-foot models feature 5 degree lateral oscillation to allow blade to follow ground contours. Also available are 5- and 6-foot clamp-on snow blade models (SBC-2160 & SBC-2172) and non-clamp models (SBS-2160 & SBS-2172). 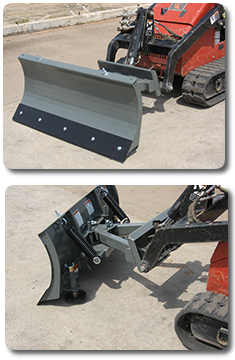 Quick hook up on skid steers or front loaders equipped with "Universal" mounting plate. View our literature. Be Sure tractor / skid steer is properly counterbalanced. Designed for Mini Skid Steers / Compact Tool Carriers, this 50” snow blade is ideal for clearing sidewalks, eliminating hand shoveling. Incorporating many of the features of our larger snow blades, this blade consistently delivers the performance you demand. Two trip springs for controlled breakover in snow, 3/8" x 6" reversible cutting edge plus Skid Shoes of abrasive resistance steel are standard. *Note: Also for Bobcat S-70 & Gehl 1640 small cab type units. • 3/8" x 6" cutting edge of 1044 steel. • Step-through design allows for easy access to skid steer seat. • Adjustable skid shoes are ½" thick and rotate for long life.